If you’re looking for ideas on what to wear on an Alaskan cruise then look no further. We’ll show you the exact types of Alaska cruise outfits you’ll need for your trip so you can stay warm, feel comfortable and look good on board the ship. When you’re going on an Alaska cruise what to wear is an important thing to consider. Having the right Alaska cruise wardrobe is essential. You will need several different types of outfits for daily life onboard the ship, relaxed excursions, more active excursions, managing cold weather and dressing up in the evening. 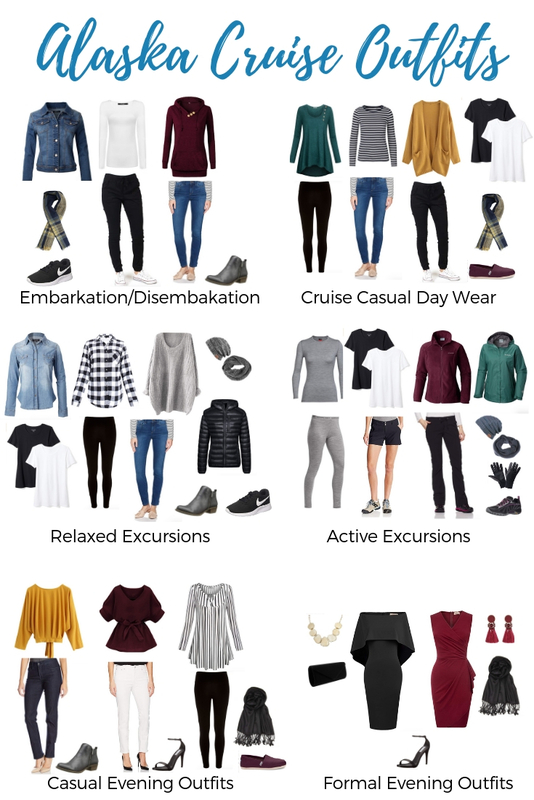 We’ll show you how to put together cute Alaskan cruise outfits for every occasion on your trip without having to pack a tonne of stuff by using different clothing in multiple outfits. For our complete guide on what to pack for an Alaska cruise and a printable packing list PDF, read this post. 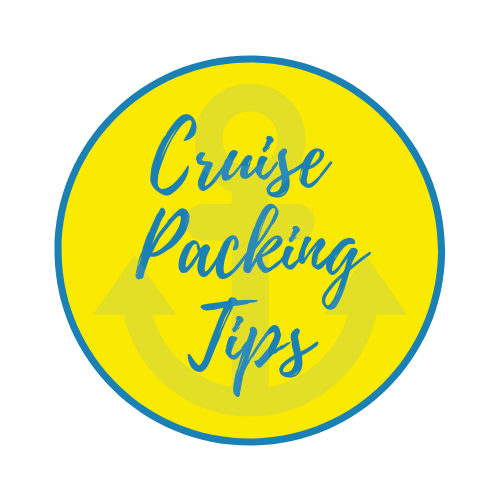 It contains the quantities of clothes for Alaska cruise that you’ll need plus all the little extra items that are useful to have. 2 Got questions on what to wear on an Alaskan cruise? Ask here! On your embarkation and disembarkation day, go for an easy travel outfit. Joggers or jeans and a light jacket or hoodie with a t-shirt underneath are ideal If you’re cruising in July or August it might actually be quite warm at your departure port so pack a pair of shorts just in case. If you’re flying home straight after the cruise you’ll need a comfy airplane outfit. 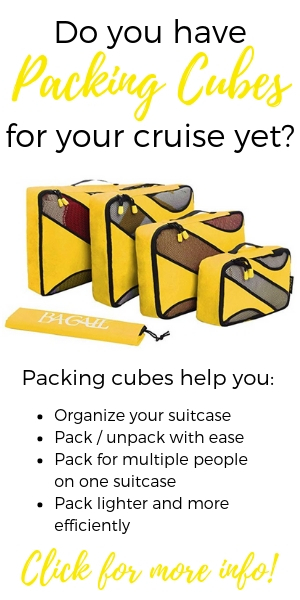 Pick items that you can use throughout your trip so you’re not doubling up on too much packing. Need more tips on what to pack for an Alaskan cruise? Check out our top 20 Alaska cruise essentials in this post! You can create some cute outfits for an Alaskan cruise. Tunics and leggings are great for lazy days on the ship. Jeans or joggers and a sweater or cardigan are great too. Depending on the weather that day you might need just a short sleeved tee or a longer one underneath layers on cooler days. Bring a nice plaid scarf for extra warmth on deck as it can be windy. It’s nice to have some soft comfortable slip on shoes like Toms to wear around the ship on sea days. When dressing for Alaska cruise one of the first things to look at are your planned excursions. Some excursions are more relaxed. You don’t need hiking or outdoor gear for activities like scenic flights, train rides and cultural tours. Relaxed outfits for Alaskan cruise excursions are similar to what you’d wear around the ship but with a bit of added warmth. A packable puffer jacket, scarf and beanie will add a tonne of warmth to your casual clothes. Dress in layers because weather can change on a dime in Alaska. What’s the best jacket for Alaska cruise travel? We recommend bringing a couple different types of jackets that can be layered to suit all weather conditions. A fleece zip up jacket, a packable puffer jacket and a waterproof parka that fits over both of these will allow you layer up or down depending on the weather. 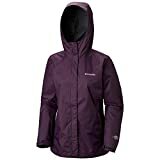 Clothes for active excursions like hiking, glacier treks, dog sledding, rafting and fishing require a bit more planning. Get a good idea of the weather before you set out for the day. Again layers are a good idea. A fleece jacket, waterproof parka and a good pair of outdoor pants are the main items you’ll need. We recommend packing a merino base layer top and leggings for extra warmth. If you’re cruising in July or August you might need a pair of hiking shorts in case of warm weather. Depending on your excursion you may need proper hiking boots or your sneakers might be fine. Alaska cruise attire is usually a bit more relaxed in the evenings than on your typical Caribbean cruise. Many people won’t change for dinner. That’s totally up to you. It depends on how busy your day was in port and how active you were. If you do wish to change for dinner on the casual dining nights, wear an outfit you’d choose for a date night. Jeans and a nice top are ideal. You can always borrow your formal night accessories and shoes to jazz your outfit up. Alaska cruise formal night wear is usually a bit more relaxed than on a typical Caribbean cruise. You won’t find many people super glammed up, although you can if you choose! A nice cocktail dress is the ideal formal dress for Alaskan cruise travel. Pack two dresses that can use the same shoes and clutch. A pashmina is a good idea for evening as it might be chilly getting from your cabin to the dining room. Got questions on what to wear on an Alaskan cruise? Ask here! Need more Alaska cruise packing tips? 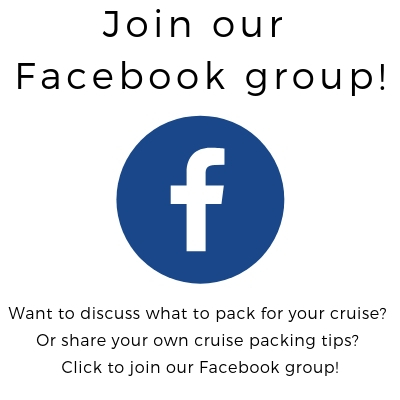 You can join our Facebook group on cruise packing to ask questions or just leave them in the comments below.